Ngati Toa chief Te Rauparaha is pursued by his enemies and fears for his life. At Lake Rotoaira, he is hidden in a kumara pit, and Te Rangikoaea, a woman of great power, sits in front of its entrance. As he hears his enemies, Te Rauparaha whispers in the dark Will I die?' Will I ... read full description below. Te Rauparaha is pursued across the island by his enemies and he fears for his life. At Lake Rotoaira, he is hidden in a kumara pit, and Te Rangikoaea, a woman of great power, sits in front of its entrance. As he hears his enemies approach, Te Rauparaha whispers in the dark 'Will I die? Will I live?'. His enemies cannot find him, and he climbs back to the sunlight. As he recounts this adventure to his people, his words are repeated and the haka rings out, and is now passed down from generation to generation. To be available in English and a te reo Maori edition titled 'Whiti Te Ra! 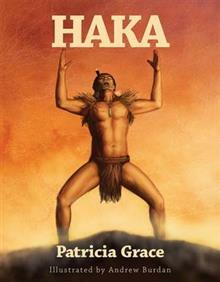 ', this children's story is the story behind the haka which has become recognisable the world over being performed by New Zealand teams at national and international sports events.